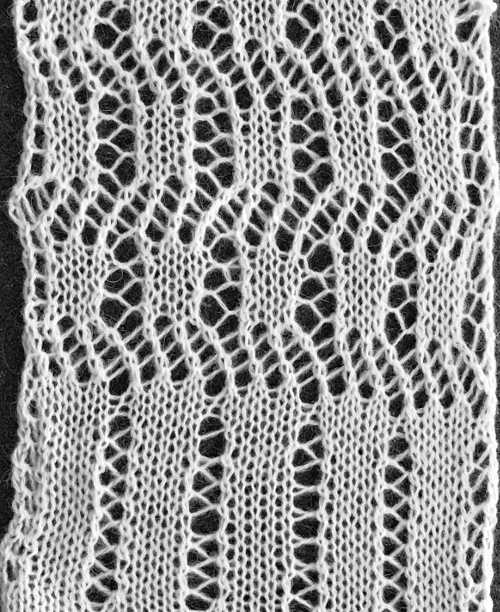 Mock filet crochet machine knit lace has surfaced in a ravelry blog of late. The sample in question was made by Tanya Cunningham, using a hacked knitting machine and software to download the repeat. 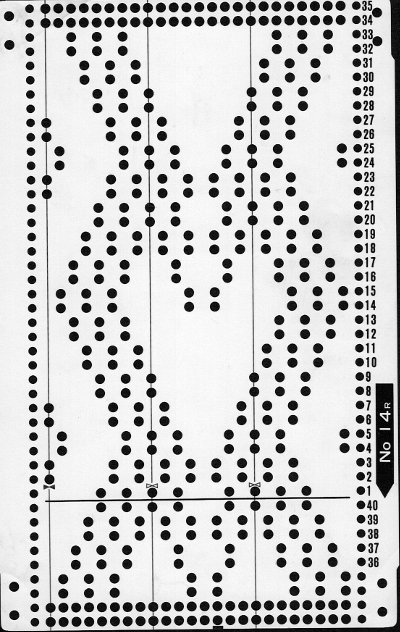 Sometimes punchcard machines or early electronic users feel left out of creating particular fabrics. If one can settle for working with simpler and far smaller repeats however, one can achieve interesting results in that scale. 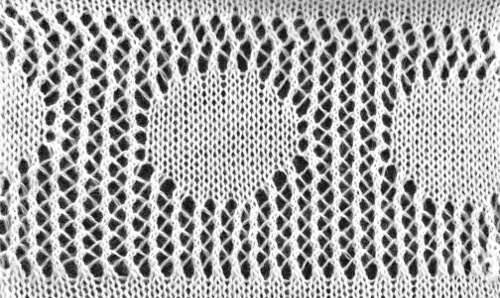 Several years ago I wrote a series of posts on lace meshes and lace patterns inspired by filet crochet, this link will take you to them. There also has been a thread lace ravelry “thread”, and today’s avoidance of housework led me to thinking about pre drawn thread lace patterns to create filet mesh. The lace carriage (LC) selects on first pass, transfers on the second. It advances the card with each pass of the carriage if is operated consistently from the same side. 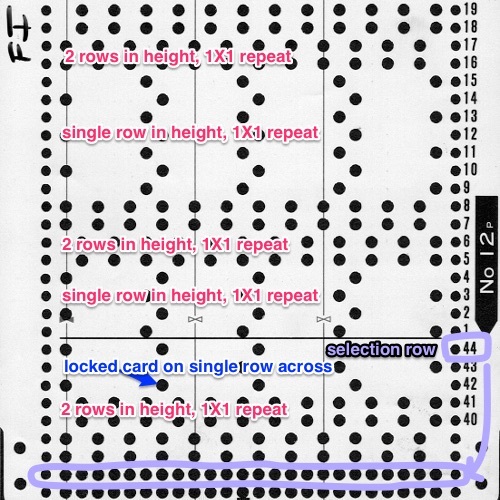 If 2 knit carriages (KC) set to select needles for any technique are in use in punchcard machines, as one is put to rest and the other one begins to move from the opposite side, the card does not advance on the first pass, so selection for the previous row is repeated one more time. If all lace transfers are made in the same direction the resulting fabric will bias. 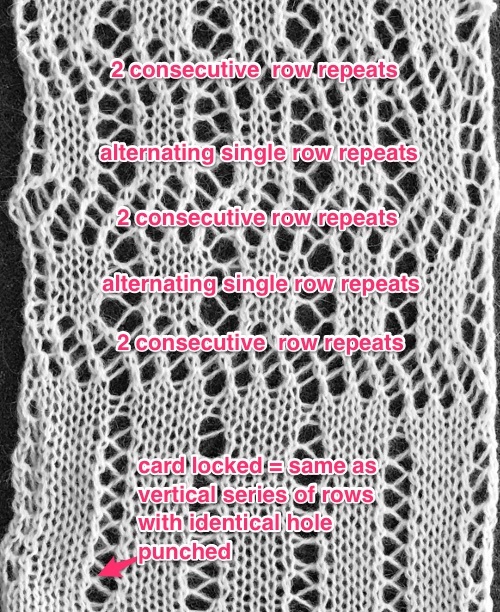 For balanced lace fabrics, the direction of the transfers needs to be reversed, whether in alternating series of rows, or with every other set of transfers. In a situation such as this, the LC makes one set of transfers operating from the left, with the next set of transfers operating from the right. For the correct set up, the first row selection with the card locked is made on the row jut below the one marked #1 (in this instance that would be row #40), then the card is set to advance as usual. If the first selection row is made with the card set to below the #1 line, the card needs to be already joined with snaps into a drum or the card reader will be selecting the all punched row which is normally part of the overlap that sits over the last 2 rows of the pattern repeat. I began with my LC on the left for transfers to the left, and alternately placed it on the right after knit row(s) for transfers to the right. 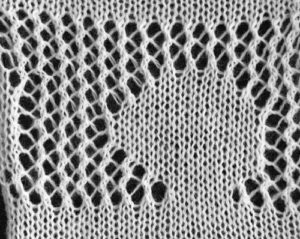 A “simple” lace is produced with only one row knit between transfers, a more complex lace if 2 rows are knit between them. The LC moves left to right, transfers back to left. If the knit carriage is used for one pass only, it stays on left. The LC is now taken off the machine and moved to the right, used for 2 rows, and will be removed from bed to ready it for its return to the left side. The KC follows with one pass from left to right. The LC is returned to left and operated for 2 rows, starting the sequence over again. The LC is always moving toward the KC to select, and away from it to transfer. 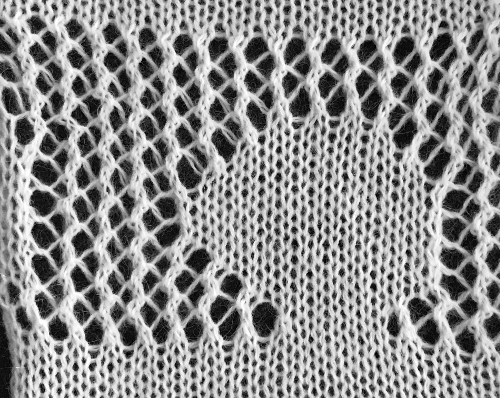 Brother knitters are used to knitting 2 rows after lace transfers. It can be done with this card as well. The problem here is that when knitting for 2 rows, the knit carriage consistently returns to the same side, so that when transfers need to be made from its starting side with the LC, the KC needs to come off the machine until after transfers are made. There is a lot more juggling of carriages and keeping track of what needs to be where. 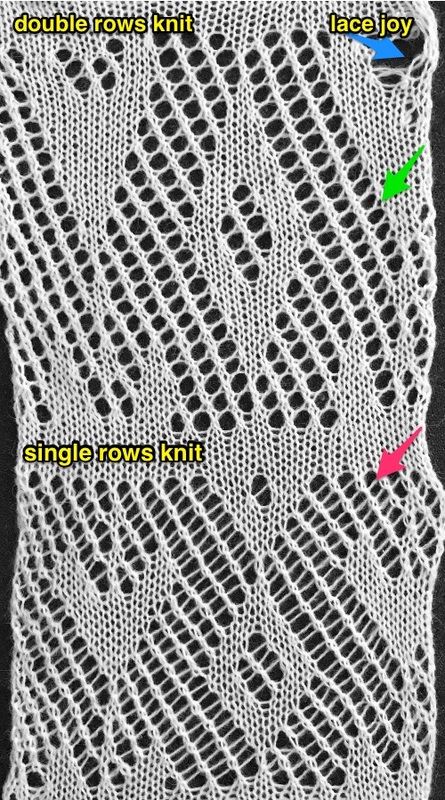 The elongation that occurs with 2 rows knit after each set of transfers, and the difference in the appearance in the yarn forming the eyelets (single/magenta arrow vs crossed/glow green arrow strands) for the respective methods is shown below. 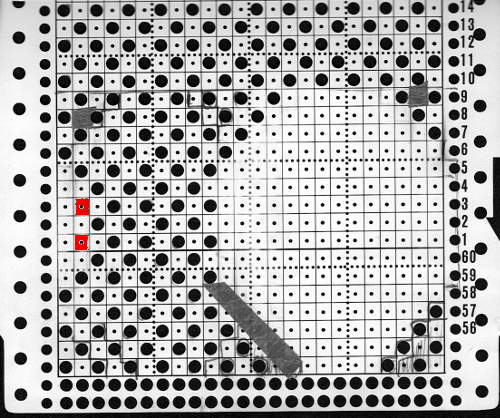 The above shows long vertical lines of transfers are possible in design motivs (punched holes). Adding shapes to all over mesh may require some editing along edges where the shapes meet the mesh. Varying size swatches are recommended before commitment to any large piece. As always punched errors may be taped over. 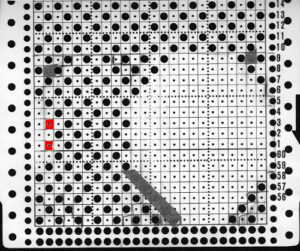 Red squares in the image below reflect holes missing in card if the goal is a smoother circular shape. 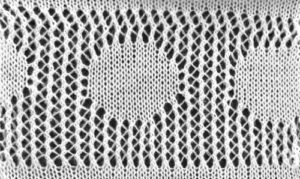 When this technique is used, selection, transfers, and knitting occur in each single, completed row of the design. The slight bias zig zag at the top of the swatch results from a missing reverse direction transfer before continuing with plain knitting and binding off. Ultimately whether the final fabric is worth the effort in making it is a personal choice. Sometimes small swatches work like a dream, and when large pieces are produced, problems multiply or the result is disappointing. In the past I have also tried to use thread lace inspired patterns for drop stitch lace (ribber fabric), but have found the result far more subtle than expected. As always yarn and color choice make a significant difference. The yarn used in these samples is a 2/15 wool blend, knit at tension 6. BTW: Studio pattern books have multiple sections of published 24 stitch thread lace patterns. Not all Brother machines have the capacity for knitting this type of fabric, so not all of their publications include “suitable patterns”. If one understands what punched holes vs unpunched do, some of the Brother weaving and “pick rib” (perhaps another post’s topic) can be used as is or adapted.